Celebrate the next Mexican holiday by swimming with dolphins in Cancun! Do you already have plans for one of the most important Mexican celebrations? We think that you could enjoy this national party by doing something totally different: this year our plan for you is swimming with dolphins in Cancun. Find out more and make your mind up about living this experience. Are you traveling with your partner? We have the perfect plan for both of you! You will share a unique moment, just the two of you, swimming with dolphins in Cancun for 60 minutes. A great advantage is that if you are staying at a hotel in Cancun, our programs include free transportation from your hotel to the dolphin habitat and back! If you are planning on having a big celebration with your friends, why not choose the Splash interaction? No doubt you will live an incredible moment that you will remember forever. You will be able to see how high a dolphin can jump, as well as the speed and strength of this unique marine mammal. Enjoy this interaction with 9 of your friends! It’s time to gather your swimming team. There is no other experience like this kind of interaction, in which you can go deep into the sea to interact with dolphins. If you do not know what to do for the Mexican holiday, you certainly have to consider this experience as a different way to celebrate. In addition, you will be provided with all our Sea Trek diving accessories, and if you have 12 year old children, they can also participate. Given this year’s national holiday is on a Friday, it is the perfect date to have a wonderful time in the Mexican Caribbean and enjoy an experience swimming with dolphins in Cancun. This will teach you more about the marine ecosystem and make you reflect about the commitment with the environment. Therefore, if you are wondering what to do for the next Mexican holiday, we have just given you 3 excellent choices. 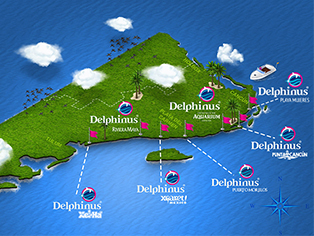 Do you want to know more about other swimming with dolphins experiences? Find more information here. Book in advance and enjoy all of this season’s benefits and discounts.